Note: Attendees of the Diversity Practitioners Workshop do not need to be a “director of diversity” but should have a formal role/responsibility within the diversity, equity, and social justice efforts of their schools. Social activism doesn’t just happen “out there”; as we know, our work is deeply personal. In this workshop participants will have the opportunity to engage in a few contemplative healing practices for cultivating compassion and connection in their daily lives. Participants will work on strengthening their capacity for care and connection in order that we might collectively grow and sustain more compassionate, equitable educational communities in which all people feel seen, welcome, and supported in realizing their fullest potential. Our aim is to take this day as an opportunity to ground, set intentions, and leave with a few tools that can help us center our own well-being in our work, so that we are able to sustain our work in schools, acting from a place of clarity, awareness, and compassion. Educators will understand the social and systemic impacts of their ability to engage with self care. Educators will leave with a felt sense of nourishment and care from the day’s workshop. Educators will have the opportunity to connect with each other to network and support each other. Educators will leave with tangible strategies and resources to support their ongoing practice of radical self compassion. 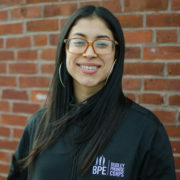 Juliana holds a B.A in Human Development from Boston College and an M.Ed. degree from Boston University. Her professional background is as a teacher in public schools in Boston and New York where she works to design and implement new models of education that integrate a liberatory education approach that centers the voices of the historically marginalized in literature and history while providing opportunities for healing and processing of intergenerational trauma in the classroom through the use of contemplative practices, and by encouraging the reclaiming of their voice and power. In order to expand this professional focus, over the past two years, Juliana has been exploring sustainable models for healing and peacebuilding not just in schools, but also in communities in the United States and in Colombia, her country of birth. This has prompted her to think more critically about how contemplative institutions might evolve to offer more inclusive space for people from historically marginalized backgrounds without recreating the violence that white supremacist and hierarchical organizational models impart on those with less power. Following this line of inquiry, Juliana co-founded the Black Lotus Collective in Boston, a space centering the healing of people of historically oppressed backgrounds. Additionally, with a an interest in how these models may be used in the global context, Juliana is co-designing a contemplative-practice based peacebuilding curriculum for use in the context of the Colombian armed conflict. Through this new endeavor she continues to enrich her professional focus, exploring how contemplative practice, a decolonized education of our collective history, and scientific methodologies can come together to explore new and sustainable ways of living.